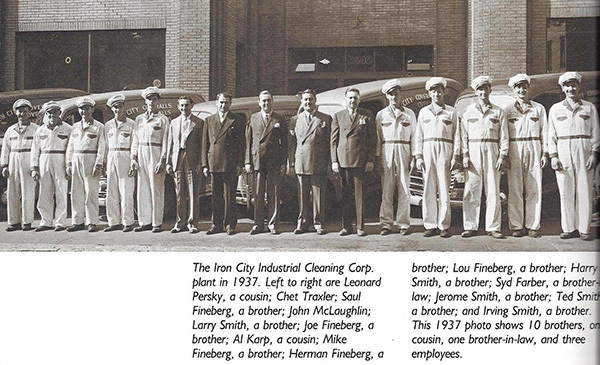 Founded in 1928 and now stronger than ever, Iron City has always been a true family business, and is now proud to enter its 5th generation of family. In 1928, Herman Fineberg founded Iron City after receiving a $3,000 loan from his father-in-law. Herman started growing the business by cleaning coveralls for workers at the Pittsburgh steel mills. We have always been a ‘true family business’ (as you can see in the 1937 photo – featuring Herman with his 10 brothers, 1 brother-in-law, 1 cousin and only 3 non-family members). Phil Sonnenklar, Herman’s grandson, joined Iron City in 1983, after graduating from Carnegie Mellon University, and has been our President since 2000. Phil represents our 4th generation of family, as his father, Arthur Sonnenklar, began working for Iron City in 1949 - retiring in 2002. Phil’s son, Zach Sonnenklar, joined Iron City in 2011 after graduating from the University of Pittsburgh, representing our 5th generation of family. Together, Phil and Zach re-branded our company to ‘Iron City Workplace Services’ in 2013.